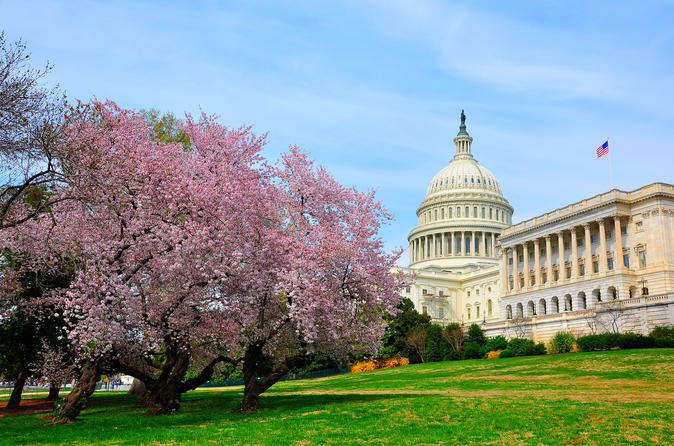 Get your cameras ready for Washington DC's most beautiful time of the year- cherry blossom season! As the region ushers in springtime, DC's National Mall and Tidal Basin are transformed by thousands of blushing pink petals. Originally a gift from Japan to the United States, the cherry blossoms bloom year after year as a reminder of beauty and friendship. You'll bask in their beauty while exploring the best of DC landmarks and attractions! Begin your tour at 10am at the US Capitol Building, and take a guided exterior walk to learn about this center of American government. Continue your tour through the city and visit the White House, World War II Memorial, Martin Luther King Memorial, Lincoln Memorial, Korean War Memorial, and Vietnam Memorial. Your tour guide will provide history and expert local knowledge as you take plenty of time for photos to commemorate your tour. At 2pm. your tour will conclude at the US Navy Memorial. You'll have plenty of time throughout the rest of the day to explore the unique beauty of the Cherry Blossom Festival!